Margaret St. Claire was politically active in the ’60s and is marching again. She has a BA in American History, an MA in American Studies, and is an avid writer and photographer with a special interest in 19th century social history. 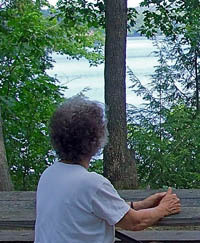 She lives in a Midwest university town near her three grown children, two grandchildren, and one very special soul mate. 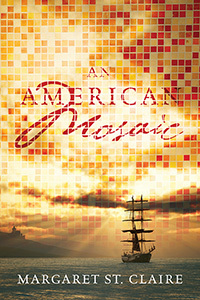 Diverse ancestors created Margaret, their American mosaic. Margaret’s remarkable forebears-including a peasant, an Indian, a slave, and a king-came from Europe, Africa and the wilds of Maine. The captivating tales in this debut novel are based loosely on Margaret’s family and cover seven generations over 150 years. There is the Jewish girl who chooses to become a Gentile; the Massachusetts man who marries the Indian from Maine; the child of the slave and her master; the man from the prairie who gets a PhD from Harvard at age 26; the Abolitionist who goes to jail for sheltering the runaway; the descendants of the indentured servant who just never have any luck; the woman who comes alone in steerage with her two-year old; the woman who goes mad on the stark prairie; the model who marries the spy. Then Margaret tells her own story of a rather lonely childhood that culminates with her exciting 9th grade year in Rome followed quickly by her mother’s cancer, her marriage at 19, and three beloved children who struggle with her as she and the marriage disintegrate. She comes out of a long breakdown at last, strong like her “sod-hut grandmother” and ready to meet her soul mate. Margaret St. Claire, writing under a pen name, presents a unique story that is semi-fictional social history with behaviors reaching over seven generations. Starting with great-great grandparents from remote places and ending with her own mosaic splendidly intact, Margaret’s saga is fascinating and eminently readable.